Gage Dayton and Will Webster at the Landels-Hill Big Creek Reserve. 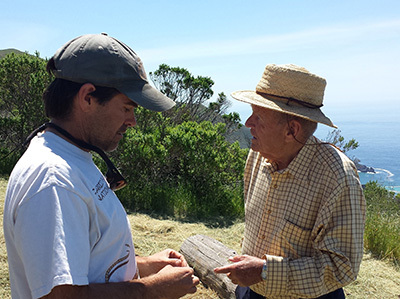 UC Santa Cruz has appointed Gage Dayton to the Wilton W. Webster Jr. Presidential Chair for the UC Santa Cruz Natural Reserves. The endowed chair was established in 2015 with a $500,000 gift from the Helen and Will Webster Foundation and matching funds from the UC Regents. 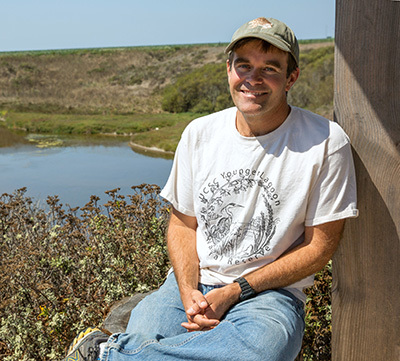 Dayton, who has served as administrative director of the UCSC Natural Reserves since 2008, said the funds from the endowed chair will provide critical support for the reserves and the programs that use them. "As outdoor classrooms and living laboratories, the reserves are the foundation for a wide range of programs for field-based learning and long-term research. This chair was created to help ensure that the reserves are maintained in their natural state for the use of current and future students and faculty," Dayton said. "I feel honored and grateful to the Websters, and I look forward to implementing the vision they had for this chair in a way that has an immediate and lasting impact on UC Santa Cruz and the reserves." UC Santa Cruz manages four of the 39 sites in the UC Natural Reserve System (NRS), as well as a campus reserve. The UCSC reserves include Año Nuevo Island Reserve, Fort Ord Natural Reserve, Landels-Hill Big Creek Reserve, Younger Lagoon Reserve, and the UCSC Campus Natural Reserve. The NRS is a unique assemblage of protected wildland sites throughout California encompassing more than 756,000 acres and providing undisturbed environments for research and teaching. At UC Santa Cruz, a growing number of courses and internship programs are getting students out into the reserves for field-based learning and research experience. The support for these programs from the Webster Foundation is helping to ensure that these opportunities are available to a broad range of students from diverse backgrounds, Dayton said. "The Websters have really supported getting young students from diverse backgrounds out into the field," he said. "The course fees for field courses can be high to cover the costs of travel, camping, and food, and we don't want that to be a barrier for students." The endowed chair will help fund scholarships and other support for undergraduate and graduate students to use the reserves, as well as providing support for maintenance activities and equipment for the staff who manage the reserves and mentor students. Dayton earned his B.S. in wildlife management at Humboldt State University and a Ph.D. in ecology and evolutionary biology at Texas A&M University. The Wilton W. Webster Jr. Presidential Chair for the UC Santa Cruz Natural Reserves is the first endowed chair in support of the reserves in the UC system. It is one of eight endowed chairs established at UC Santa Cruz in 2015 through gifts from campus supporters and matching funds from the UC Presidential Endowment Fund. Increasing support for endowed chairs and experiential learning opportunities for students are goals of the Campaign for UC Santa Cruz, which to date has raised more than $248 million in resources for the campus.